UBC’s Okanagan campus offers two spaces for exclusive use by graduate students. Access to both areas is granted to current graduate students who agree to abide by the terms and conditions outlined on the Graduate Space Access Request Form. The Graduate Student Collegium offers a social place for graduate students to hang out, eat lunch, and spend time with peers. Graduate students can also book this space for events. The Graduate Student Collegium is set up in a relaxing lounge-style atmosphere, outfitted with comfortable furniture, a television, individual and group work spaces and kitchen facilities. To access the space, graduate students will need to fill in a Graduate Space Access Request Form while postdoctoral fellows requiring access should email gradcommons.ok@ubc.ca directly with the subject line Postdoc access. Once you submit the form, a request will be made for a SALTO card. It takes approximately two weeks for the card to be processed. You will be notified when your card is ready and you may pick it up at the Library service desk on the first floor of the main library building. For students with existing SALTO’s, you will still be required to submit the form and will be notified once your SALTO is activated. You will be given access to both ASC 460 and COM 310. 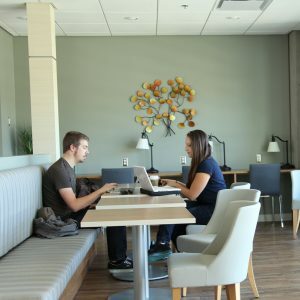 The Graduate Student Commons is a space uniquely designed to foster graduate student collaboration and support the overall academic wellbeing of graduate students on UBCO’s campus. Located on the top floor of the Commons, these dedicated graduate study spaces help to strengthen a sense of community for graduate students at UBC Okanagan. Filled with natural light and student-centric design, the Graduate Student Commons is an ideal space for individual or group study. To access the space, graduate students will need to fill in a Graduate Space Access Request Form while postdoctoral fellows requiring access should email gradcommons.ok@ubc.ca directly with the subject line Postdoc access. Once you submit the form, a request will be made by the Library for a SALTO card. It takes approximately two weeks for the card to be processed. You will be notified when your card is ready and you may pick it up at the Library service desk on the first floor of the main library building. Once you fill out the access form, you will be given access to both ASC 460 and COM 310. For students with existing SALTO’s, you will still be required to submit the form and will be notified once your SALTO is activated for access to the Graduate Commons space. Please note: If you are a postdoctoral fellow requiring access, email gradcommons.ok@ubc.ca directly with the subject line Postdoc access.